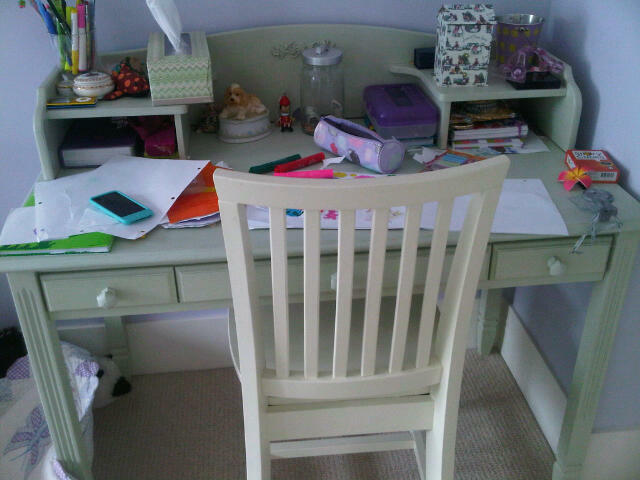 My daughter’s desk. Where to begin? I am drowning in hoodies. Floating amongst art projects. Suffocating under Playmobile. Awash amongst chargers. In the war of Stuff versus Me, Stuff is winning, hands down. My white flag is flying outside of my door, if anyone can see past the planters, bicycles and soccer nets that are obscuring it. So it makes little sense (or else all the sense in the world) that because we are stuffed, from attic to crawlspace to disorganized garage, with Stuff, that we are downsizing. In one short month, we are moving to a house with roughly half the square footage of our current abode. I’m worried that instead of hiding the chaos in cupboards and closets and underneath beds, as is now the case, I will be tripping over it while I make dinner. In typical fashion, instead of taking it in stride I am panicking. Not on the outside. No, I’m all I love getting rid of all of this junk! I’m de-cluttering! I feel so great – so much lighter! So free – you should try it! Shoving downsizing down every available throat I see, so that everyone might share my pain. It’s all great until someone loses an eye that they needed, or a hula-hoop. What then, pray tell? This is the sound of my interior war I wage. 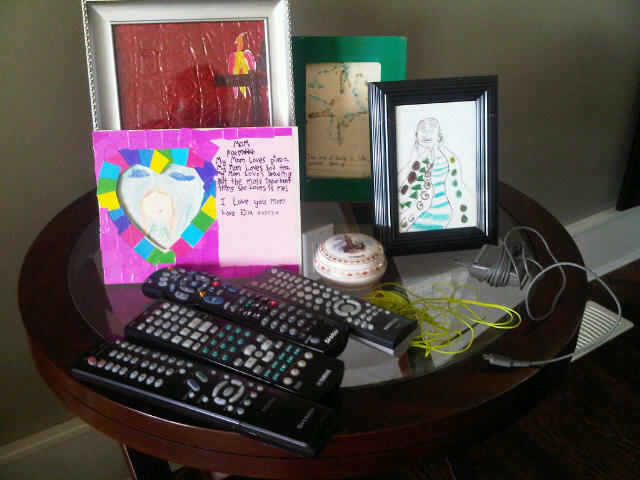 Any FRAMED artwork from my children I declare as safe, but the rest is up for grabs. Don’t even get me started about our 4 remotes. Shakespeare had it all wrong. To toss, or not to toss, that is the real question. Some answers are easier than others. Any clothing, whether remotely stained or in need of mending or repair, out of style, or too tight in the bum? Gone to Salvation Army. Bins filled with Barbies and Little Ponies that are gathering dust? Banished to our garage sale. Ikea shelving that I never got around to installing? Again, easy garage sale material. Step stools, the pink Hungarian platter from my husband’s great aunt, side tables with wobbly legs, Pilates DVD’s that seemed like a good idea at the time, learn to read books: gone, gone, gone. 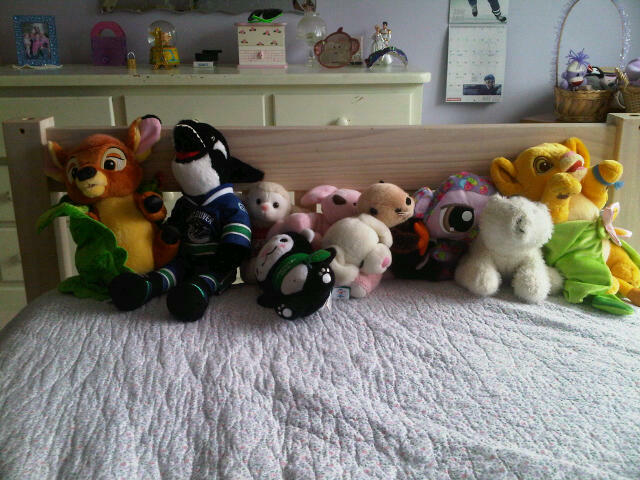 Stuffies have ruined my life. No joke. But then there is the memorabilia. The box full of essays I sweated over in university that now read like Greek to me: I could peruse these one rainy day and learn about Thomas Hobbes all over again, it would be like a re-education. A meeting of my twenty-year old mind. Toss, or hold on to for that rainy day in my future? Baby clothes and dresses too cute for words, surely my kids will want these when they are thirty, so what’s twenty more years of packing them around? The plethora of vases that look divine with the right arrangement, which never seem to materialize, but one day might. The snow globes and trinket boxes from travels, the doilies from great-grandmothers who have passed, the mismatched coffee mugs that hold the perfect amount of coffee. This is the stuff over which I agonize. And unfortunately, it constitutes half of our belongings. Oh, The Places You’ll Go and the Stuff You’ll Accumulate Along the Way. What would Dr. Seuss do? How do you determine whether to toss or not to toss? Someone, make all of these decisions for me! Wow, you’re brave! HALF the space? At any rate, your sanity aside, I am not the one to ask about this, as, if it were up to me, nothing would be tossed–ever! Sara says I’m a horder. I doubt that I am, but still–I don’t dare offer advice——–or, God knows, comment on your sanity. But my bipolar diagnosis notwithstanding, I’d be freaking out, as well. But, then again, I’m no where near normal in this arena. Hell, I’m so far from the center of the bell curve when it comes to stuff, I can’t even hear the damn thing ringing. When it is all said and done, it will be fine. Till then, I’m having heart palpitations. Who knew I was a closet hoarder all these years? Besides, normal, I think we can both agree, is overrated and boring. Hoarders unite!